It is officially Mohamed Salah's favourite meal – with plenty of rice and lots of macaroni as the adored Egyptian footballer said recently. However, in most Koshary restaurants now, there's not ‘lots of rice.’ The dish is mostly a blend of macaroni – at times with some vermicelli, with only very little rice and some black lentils. 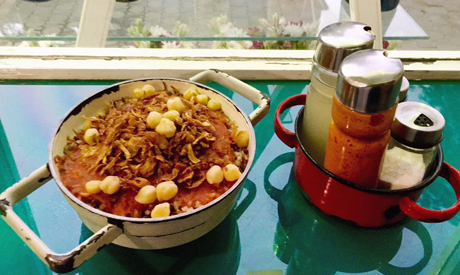 Of five Koshary restaurants: Cairo Kitchen, Eshta, Hend, Sayyed Hanafi and Zooba – the first seems to offer the largest portion of rice in its little red or white metal dishes, or nicely packed into large and small sized boxes. Zooba comes next. 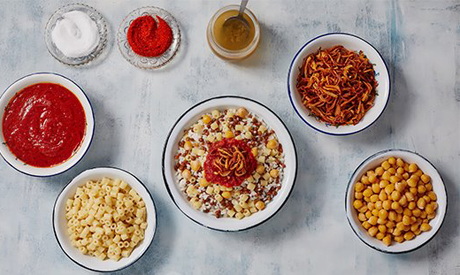 Predictably, these are the more expensive places to eat Koshary, in comparison to the other three, which although they are not the ultimate ‘street koshary,’ are still a great deal closer to the most economic version of this filling meal. Rice is crucial in the original Koshary recipe, but it is dwindling away from plates as an inevitable side effect to the agricultural complications coming with the government strict regulations related to growing concerns about water availability. Of these five, places, Hend, a small restaurant on El-Thawra Street in Heliopolis with branches across east Cairo, seems to be the one with the taste closest to the traditional recipe – especially in terms of the density, flavor and abundance of its seasoned tomato sauce. 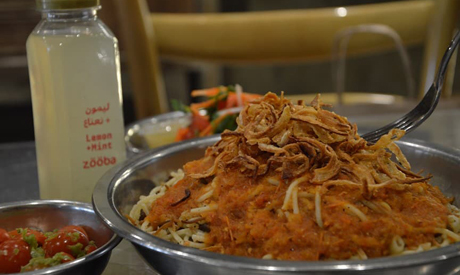 Eshta, another east Cairo chain, comes second – but its golden fried onions, the ultimate crown of the plate, come ahead of Hend's. Sayyed Hanafi, a chain with branches across the capital, promises a satisfactory experience in terms of quantity and price. It also has the incredible asset of being open around the clock with a delivery service. These three, Hend, Eshta and Sayyed Hanafi, offer a decent meal – with a possible rice pudding dessert for around EGP 35. Double the price, or a bit more, would be required for either Cairo Kitchen or Zooba – more upscale chains with more limited presence across the capital. Cairo Kitchen has suspended its un-traditional and very good ‘brown’ version of Koshary, which used to use brown rice and macaroni. It's a pity for those who liked to stay calorie-conscious when consuming a vegetarian dish, not traditionally served to weight-watchers. Zooba has however stepped in with two untraditional Koshary recipes. One replaces the rice and macaroni with frik (green durum wheat) and sautéed vegetables, with caramelized onion chips and mild tomato sauce on top. In its other untraditional format, Zooba keeps the orthodox recipe adding a topping of liver or sausage.